We’re off to Philly for a few days of snooping around. Feel free to have a look around here while we’re gone. Back next week. Once We Get Through This…. Photo by Toby Melville, REUTERS. Heard on the streets of the city this afternoon, a gaggle of folks walking in the opposite direction, very much engaged in their conversation. One of the guys says, “Once we get through this….” He meant this economic recession or meltdown or whatever you call it. Which got me to thinking. My strong and admittedly cynical suspicion is that most folks think that recovery looks just exactly like the last quarter of 2007, say. That is, recovery looks like the city and suburbs of last spring, just before the blizzard of foreclosure and for sale signs, see-through office buildings, and mothballed construction projects stopped in medias res. Full stop in Vegas. AP photo, for the Boston Globe. Once we get through this, construction in Las Vegas will resume and all the teetering stunt-itecture will be completed. Once we get through this, we can go back to our old jobs. Once we get through this, everything will be just like it was before. Once we get through this, we Americans, 5% of the world’s population, can get back to using a third of the earth’s resources and generating a third of the earth’s waste. Not so good. I guess the real question may be: how do we keep any kind of economic recovery from bringing us back to where we started? How do we leverage the loss of trillions and the relatively slight reduction in ridiculous consumption and waste that we’ve seen in the last few months into real change in the culture? 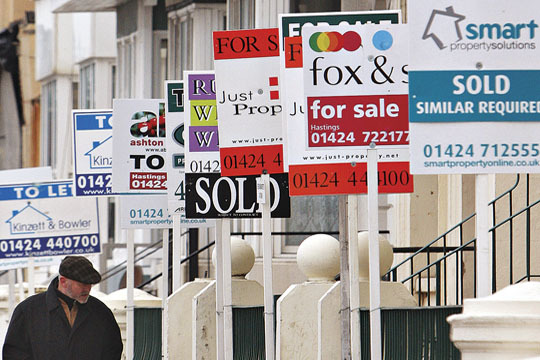 Will we ever get over the idea of continuously expanding and unending economic growth? I am reminded of the words of economist Robert Costanza, who says: “The universally appealing notion of unlimited growth with reduced energy consumption must be put firmly to rest beside the equally appealing but impossible idea of perpetual motion.” Where is Adam Smith’s Invisible Hand when we need it? Smith, in The Wealth of Nations,written in 1759, posited that someone who was pursuing his or her own economic self interest would be led by an invisible hand to simultaneously, and unintentionally, add to the common good of society. Hah! How about that, Bernie Madoff? The momentum of a giant global economy based on endless expansion is extraordinarily powerful, though absolutely unsustainable, in every sense of that word. How do we turn this thing around? Maybe we need a 12-step plan. Consumer’s Anonymous. Gather with your neighbors. One day at a time. Amsterdam, painted by Jan Micker in 1652, 350 years before Google Earth. 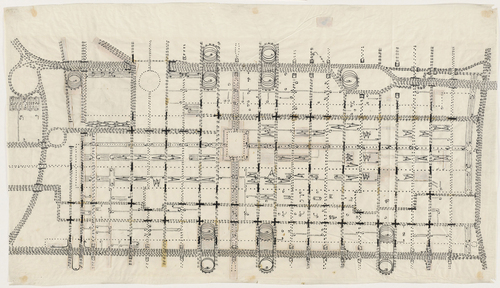 Lately I have been provoked to reflect on the shapes and forms of urbanism past and future, about the nature of compact and dense urban places, and about what makes the next city, or any city, literally sustainable. Let me explain. This last weekend we had a chance to make a last-minute visit to the National Gallery here, to see a sensational exhibition entitled “Pride of Place: Dutch Cityscapes of the Golden Age.” Featured were dozens of wonderful paintings, maps, and drawings of 17th century Dutch cities. Unfortunately for my readers, the show closed May 3rd. There is, however, a terrific catalog if you’re inclined. This was a time of a powerful and compelling urbanism in the Dutch low country: Amsterdam, Delft, Haarlem, The Hague and other cities were burgeoning with wealth, commerce, and an explosion of what Daniel Burnham would much later call civic loyalty. 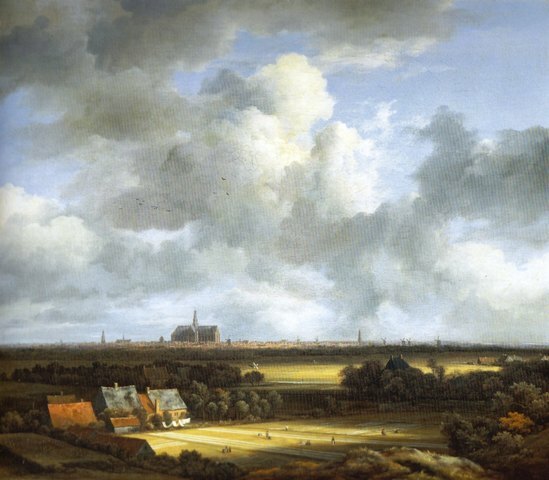 Jacob van Ruisdael, Haarlem, 1672. 17th century Dutch cities all shared a few common characteristics. They were watery – canals and barges are everywhere in the paintings. They were very dense and very compact. They had extraordinary public spaces, ranging from plazas in front of the City Hall or Church, to marketplaces, to tree lined quays along the banks of the canals (my favorite: the bier kade or beer quay, depicted by Jan van der Heyden in 1670 Amsterdam). Jan van der Heyden, Amsterdam, 1670. The Bier Kade is at the left. And interestingly, they were walled. They had very distinct edges. They were separated from the surrounding landscape for reasons of security, certainly. And to contain the water, perhaps. But I think something more may have been involved in maintaining this kind of very sudden and distinct threshold between the urban and the rural. Sustenance. Sustainability. Cities have always been predicated on surplus. And Dutch cities enjoyed a surplus of foodstuff from the immediate and adjacent fields, as well as the bounties of their commerce and trade with distant markets. 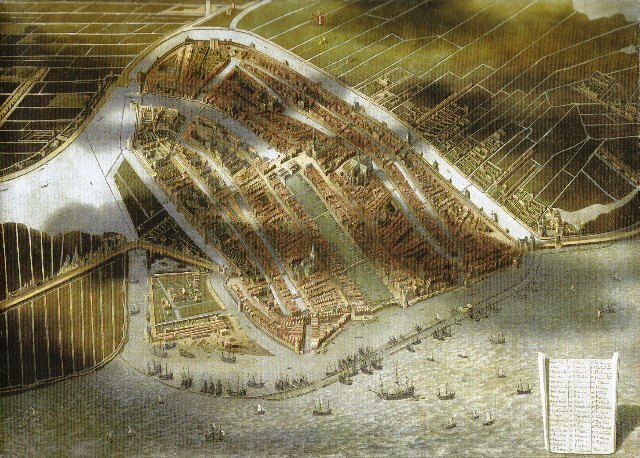 In 1670 Amsterdam was a city of 200,000. This meant nearly a million pounds of food a day, every day, to keep everyone whole. And no Safeway, Costco, or Lean Cuisine in the freeze. So agricultural land was a critical factor in making this urbanism possible. The dense and compact city could work because there was plenty of tillable land immediately adjacent to the community. Many of these paintings depict a completely rural setting with grazing beeves and rows of potatoes within a few feet of the city walls. Food was very close at hand. And today, in our cities? Today, less than 2% of Americans are farmers. A typical supermarket stocks over 45,000 items, from all over the world. We have endless choice, all year round: asparagus in February, cherries in December. Food remains close at hand, thanks to an industrialized agriculture that reaches to every corner of the globe to put food on our tables. This is a system that is, of course, completely untenable (read unsustainable), from any number of perspectives: pollution, security (when we can no longer sustainably feed ourselves and must rely on others, we can no longer rely on access to necessary quantity and quality), water scarcity, health. While it is true that grain production has increased three-fold since 1950, the real cost of this productivity is becoming clear as water disappears and aquifers dry out, streams and rivers are polluted, the air is filled with livestock methane and CO2, and increased demand drives prices up, both here and abroad. It now takes 10 calories of fuel to produce one calorie of food on Giant’s shelves. That’s five times more than 50 years ago. 10,000 feet above Fairfax, Virginia. Here we are, 15 miles from the Washington Monument, in suburban Virginia. Cul-de-sacs and cars, strip centers, and folks spread out all over the place. 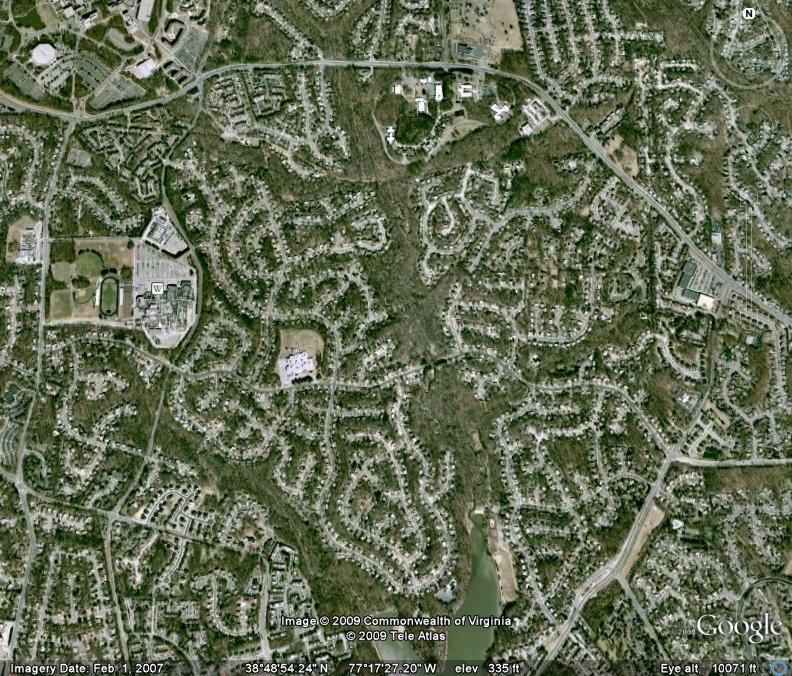 You could pick most any American city and find the same patterns of settlement. Now I am not advocating building walls around our cities. And I am going to continue to stay out of the “what-to-do-with-the-suburbs” debate. But I am struck by those 17th century paintings, that agriculture so close to the dense city. If we actually were to make the next city much more dense, as I think we eventually must, perhaps we too could sustain ourselves from nearby fields. What, exactly, is a sustainable city? 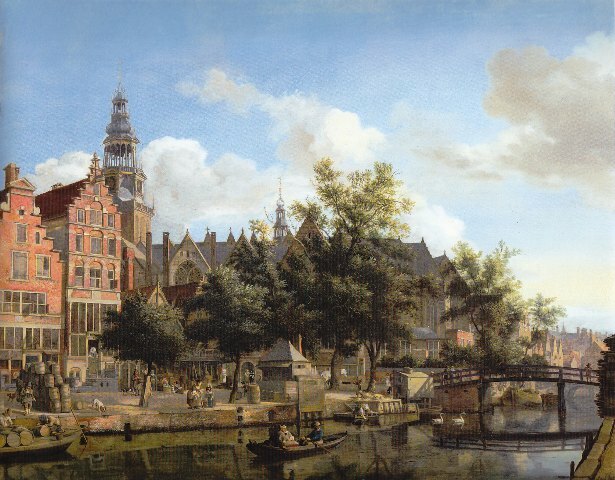 If a sustainable city is one that can support itself, and meet its needs, without doing so at the expense of others present or future, near or far, then perhaps the Dutch cities of the 17th century were indeed a Golden Age. Een taal is nooit genoeg. 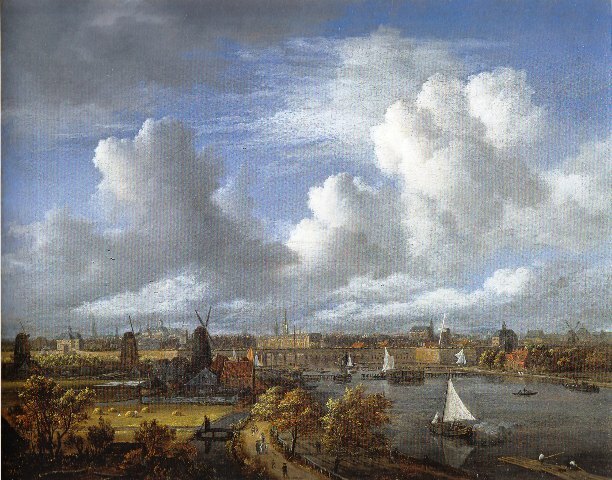 Jacob von Ruisdael, view of Amsterdam, 1680.